Mayzie is the middle sister, sent to private school because of her brains. Brooks, the oldest, is a beautiful athlete who's conflicted about her two loves: softball and Dave. Palmer is the youngest, tentative in all but her blistering pitches as the only freshman on varsity softball. Though very different, the Golds are sisters through and through. When the unthinkable happens‹the death of their father‹a year passes in shattered silence. Brooks begins drinking, Palm withdraws, and May is left to fend for herself. She gets a job at a coffee spot, and hits the books. But the one thing she can't do alone is learn to drive. That's when Peter, her lifelong nemesis and all around thorn-in-side, assumes a surprising new role in May's life: he teaches her to drive, and the connection between them changes from childhood animosity to one that May can't understand, or doesn't yet want to. As May slowly starts to pick up the pieces of her life, her sisters struggle with their own demons. The Gold sisters have been changed irrevocably, and they are all but lost to one another, until the key is found. The key to their father's Pontiac Firebird. 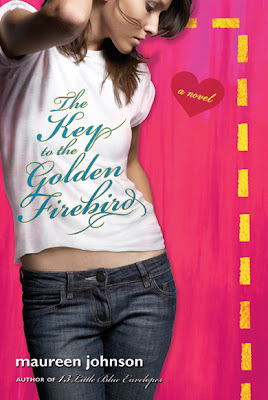 The Key to the Golden Firebird is a story about growing up, letting go, following your heart and discovering the true meaning of sisterhood. I've read this book before but when I did my YA Boys: The Good and Bad Eggs, I wanted to read it again. So Im going to do just that. OTMM Reviews are posted on Thursday! I really love this book, too! I've lost track of how many times I've read it. My favorite MJ book. It was so real. I def. own the alternative cover one though haha.